Oh, the 5k. Exhausting. Satisfying. Accomplishing. Overcoming. These are all words I would use to describe my recent experience, running my very first 5k. For two years now, I have run on a treadmill 3-4 times a week. I started running after I had my daughter because of self-inflicted knee problems. It was all I could do. Literally. My runs started out at 4.0 mph for 30 minutes / 3-4 times a week. Over the next two years, I gradually made my way to running at 5.0-5.5 mph for 60 minutes / 3-4 times a week (and could even give a short burst at 6.0 mph!). The increase wasn’t fast, it was gradual. Pushing myself a little more when I felt I had become accustomed to that speed or time. Sometimes I increased my speed, sometimes my time, sometimes both. Running a 5k had been a goal of mine since I had Kait. I had become fond of running. Since I was running on a treadmill, I eventually moved from music to Netflix. Watching different seasons of shows can really help you through some workouts! (haha) When New Year’s rolled around, I had decided this was the year I would run my first 5k. So I signed up for one! I chose one a month out – not too soon – not too far away. I wanted something where I could see the goal in the NEAR future. I pushed myself harder in running. I had many, many more times of stopping for a second to catch my breath. I pushed beyond my comfort level. My goal for my first 5k was to finish in under 45 minutes. Not the fastest time, but with not usually running on pavement, I felt it was a good first goal. The morning of the run, I really didn’t know what to expect. I was going to set my pace like on the treadmill and just go. Not caring who passed me, I just wanted to run for me. I warmed up, stretched, ate half a banana, prepped my playlist… and started. Within the first 60 seconds of running it was really difficult. With 30 degree air filling my lungs, my body just wanted to quit. (Treadmills are indoors!) I pushed through, my playlist changed to the second song, and my body just set its own pace. I felt a little “pep in my step” kick in, lol. I kept the pace as long as I could – and pushed until I couldn’t push anymore. As I crossed the finish line I saw my time… 29:09. Not only had I beaten my goal – I had beaten it by a wide margin! I was so disoriented from pushing myself that hard (in that cold of temperatures) I actually wrote my age down incorrectly on my time card. I have just recently turned 32… I wrote 35. I was dizzy and couldn’t get my bearings for about 10 minutes. Imagine my surprise when I found out I had won 2nd place in my age group – in my very first 5k!! For the next 3 days, I could barely stand and barely eat. My body had not experienced this sort of soreness in a long time. Being so sore you actually had body aches (really muscle aches) that felt like you had the flu. The very thought of food made me want to throw up. I ate as I could and tried to continue to stretch my muscles out – but it was a task each and every time. I really felt like I was pushing myself when training for this 5k. I was out of my comfort zone, I couldn’t breath. I was drenched in sweat, I stunk to high heaven. My times increased, my mileage increased. However, on the day of the actual race, I realized there was room to push even harder. A LOT of room! I was not pushing myself NEARLY enough when comparing the two. How many times do we do this in our spiritual life? Do we push ourselves to being just out of breath enough where we can stop for 30 seconds and hop back on? Or do we push ourselves so hard we can’t eat for 3 days? Life is a run. We have 5k’s, 10k’s and marathons within our life. In order to win these races we have to train. A runner does not run one time a week for 10 minutes. They train daily. The eat the right foods. They go for extended runs. In our spiritual life, we should be diving into God’s word everyday. Praying everyday. Fasting when HE calls us to fast. In order to win this race – and do it right – we must be pushed outside our comfort zone. I bet you are reading this right now thinking about how much more you could push yourself to seek God. You are thinking how often do you do what God has told you to do – and now you have prolonged the finish line. Every race we have in life is preparation for the next race. 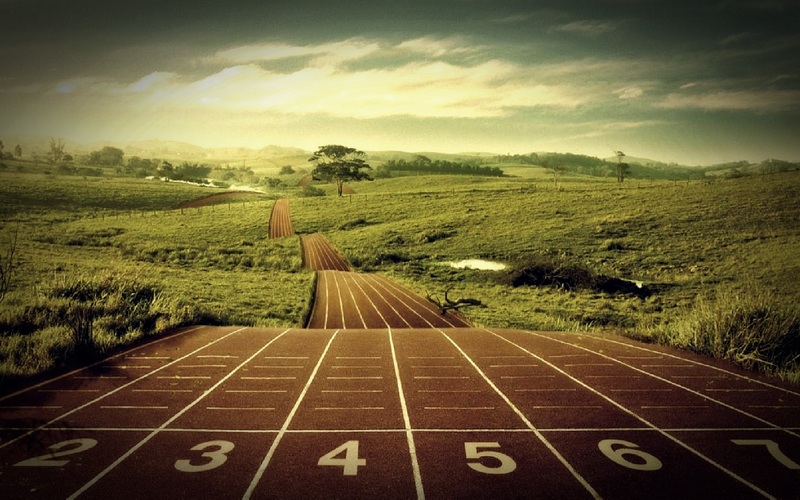 He gives us an opportunity to train – run the race – and gain the faith and endurance to face the next race. The race that is uphill. The race that takes you through months of struggle. The race that has you on your face crying your eyes out because you don’t understand why you feel the way you feel. The race that leaves you wondering is God even real. They are all real races but He has given you opportunity to be prepared for them. It’s up to if you will train to the point of exhaustion. To the point of being satisfied. To the point of feeling accomplished. To the point of overcoming the battle and winning.